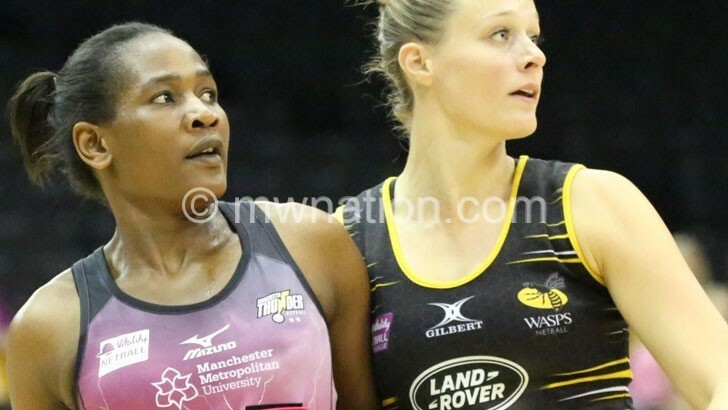 England-based netball player Joyce Mvula inspired Manchester Thunder to a 76-46 win over Celtic Dragons on Sunday. According to the club’s website, www.manchesterthunder.co.uk, the Malawian shooter was outstanding as the team maintained their top spot in the Vitality Superleague. “Thunder got off to a flying start as they managed to rack up an impressive 20 goals in the opening 15 minutes. They were dominant in possession and successfully imposed themselves on Dragons, who currently sit 6th in the Superleague,” reads the report in part. The former Blue Eagles Sisters player’s performance mesmerised Thunder’s fans. “Thunder added another massive 20 goals to the tally in the second quarter, showing their strength and stamina in the face of a resilient Dragons defence. Mvula’s prowess under the net was nothing short of spectacular and the Thunder crowd showed their appreciation for her signature lunge catches,” states the report. In the previous match, she achieved 100 percent shooting accuracy as her team beat Strathcyde Sirens 62-36 in Glasgow, Scotland.